When I first heard about Razer, they were a company that strictly made gaming peripherals. I mostly associate them with their DeathAdder mouse, with the version from 2010 still being one of the best mice I've ever used. Razer has also made audio equipment like gaming headsets for quite some time, as well as a line of gaming keyboards. As time went on, some of these products gained features that were unique to Razer, such as the use of Razer-designed mechanical switches in their gaming keyboards, and RGB backlighting in various products with the Chroma branding. Razer has made a number of attempts to move beyond the world of gaming peripherals. Some have been more successful than others. For example, some gamers may remember the Razer Edge Pro, the gaming tablet that never seemed to catch on with consumers. Razer also made a fitness band called the Nabu, but it also appears to have missed the mark and has seen some pretty heavy discounts in recent times. With Razer's recent purchase of NextBit, many have begun to speculate on whether Razer plans to move into the mobile industry. While it would be fun to speculate on Razer's plans for the future, they do have one area beyond peripherals that has been an undisputed success. Their line of laptops, which started with the unveiling of the original Razer Blade in 2011, have shown that it's possible to build gaming laptops without the bulky plastic bodies and poor quality displays that traditionally characterized high-performance laptops from other vendors. As time has gone on, Razer has iterated on the original Razer Blade, and introduced both a smaller model in the form of the Razer Blade Stealth, a 14-inch model to carry on the name of the original 17-inch Razer Blade, and the Razer Blade Pro to fill the 17-inch space. That latter model is the laptop I'll be looking at today. Prior to the launch of this new model in late 2016, the Razer Blade Pro was last updated in 2014. That model was put in an awkward position right from launch. It came with NVIDIA's GTX 860M GPU, which was actually a step down from the GTX 870M in the 14-inch Razer Blade that was updated around the same time. It also only used a 1080p display due to limitations in what 17.3-inch panels were available on the market, while the 14-inch Blade Pro clocked in at 3200x1800 despite being $100 cheaper. The headline feature of the 2014 Blade Pro was its SwitchBlade touchpad, but it again suffered from unenthusiastic reception in the market. Ultimately, the Blade Pro ended up being a more niche machine, which didn't really offer advantages compared to its little brother except for users who really needed such a large display regardless of resolution. With the 2016 Blade Pro, Razer is changing up their strategy. When I think about gaming laptops, it seems to make sense to me that a larger model will have fewer power and thermal limitations, and so it should be even more powerful than the smaller versions. For example, a 13-inch MacBook Pro is less powerful than the 15-inch model. The 2016 Blade Pro follows that line of thinking, and pushes the performance of Razer's gaming laptops farther than ever before. I've outlined its specifications below. As you can see, the Razer Blade Pro is quite the laptop. It's certainly not the bulky, heavy, tank-like device that you get when you buy a desktop replacement (DTR) from Clevo or MSI, but it doesn't compromise on performance in order to do so. Inside is NVIDIA's fastest GPU, the GTX 1080. There's also a pair of PCIe SSDs, Intel's i7-6700HQ CPU, 32GB of 2133MHz DDR4 memory, a UHD display with Adobe RGB color support, and an assortment of ports so you can connect all of your existing devices without issues. With all that power in a relatively thin and light chassis, it's not a surprise that the Blade Pro comes at such a high price. 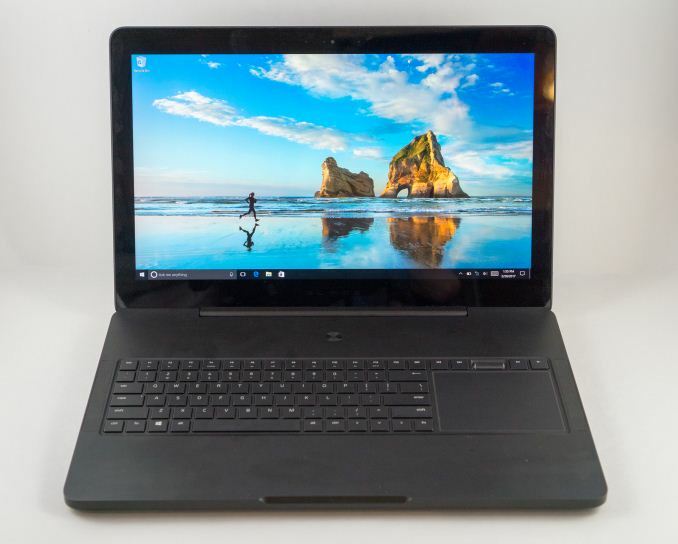 The 2014 Razer Blade Pro launched at a price of $2299, although it was lacking in the spec department in many ways, and the 14-inch Blade, with better hardware, was cheaper at $2199. Now that the Blade Pro sits at the top of Razer's laptop line for both size and performance, a price gap is actually justified. For the model with 512GB of internal storage, the Blade Pro costs 3699.99 USD. Moving to 1TB brings the price up to 3999.99 USD, and the 2TB model is the most expensive at 4499.99 USD. As I mentioned before, the 2014 Blade Pro definitely had room for improvement. The 2016 Blade Pro also comes after two years of technological improvements, and it has great potential as both a gaming machine and a mobile workstation. To start things off I'll go over the Blade Pro's design, before moving on to performance testing. From the article: "The 2016 Razer Blade Pro is a great gaming laptop. I certainly wish I could afford one for myself. My life right now is characterized by frequent moving due to work and university, and something like the Blade Pro would allow me to bring an incredibly powerful machine with me wherever I go. While the Blade Pro fulfills its role as a high performance gaming machine, it did let me down as a mobile workstation." As an OS X/macOS user over the last decade, their last half year 'computationally, has excited me as much as a three hundred mile road trip to grandpa and grandma's in the station wagon as a kid. And I can't be totally sure, but I think I might not be their 'audience' any longer...kinda feel unwanted after a pair of 17" 2008/2011 & two 15s in the Intel era, 2012 and 2015. Plenty between my '83 IIe and current 2015 15"
Mid level technical professionals... The business is buying it, so the price is pretty insignificant compared to salary and overheads. Sure, most of my workload is offloaded to a DB or compute node somewhere, but loads of prototyping and presentation workload is done on the laptop/client side. Quadcore is essential just to run things like Excel/Tableau, and a decent graphics card is useful for Illustrator, or running neural nets; or spending a bit of time relaxing playing a game on an international business trip.